February is a special time for congenital heart defects. What started as a Valentine’s Day celebration has turned into more, with many places around the world hosting special events during the week of February 14th or even throughout the month. When heart moms Anna Jaworski and Jeanne Imperati discussed the need for a special day for awareness for the congenital heart defect (CHD) community in 1999 something amazing happened. Jeanne shared a proclamation with Anna for Angelman Syndrome Awareness Day. Anna took the proclamation and used it as a template. 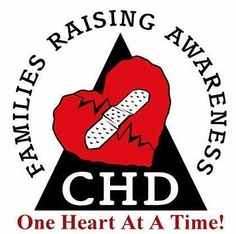 She created a proclamation for the CHD community and shared it with others. February 14th, formerly Valentine’s Day, is now Congenital Heart Defect Awareness Day. The Congenital Heart Information Network (C.H.I.N.) took over organization for making Congenital Heart Defect Awareness Day first a national and then an international event. Now countries and states celebrate CHD Awareness not only on Valentine’s Day, but sometimes for the whole week including Valentine’s Day or the whole month of February! Check here (http://www.tchin.org/aware/) for specific dates and events associated with this special day. Meanwhile, check back here often for listings of events for 2014.